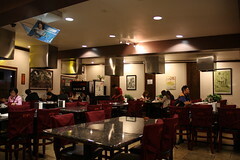 Gyenari, a new restaurant in Culver City's restaurant row opened by William Shin which presents a menu influenced by William's long lost cousin Debbie Lee of The Next Food Network Star fame, is one of the few Korean themed restaurant on the Westside of Los Angeles. When I received an invitation from the PR to visit Gyenari, I was more than happy to accept the invite. 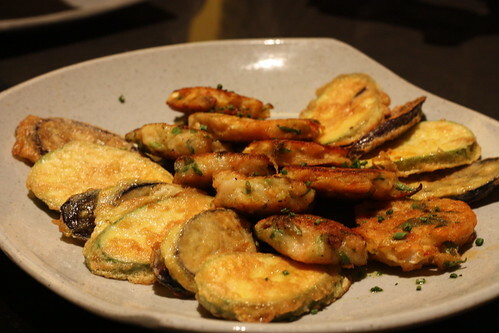 1) Grilled Eggplant with a spicy miso paste - Good texture, and the miso added a nice kick. 3) Beef with onions - Good flavor, but didn't really stand out. The soju caipirihna, presented to the entire party was actually quite nice. 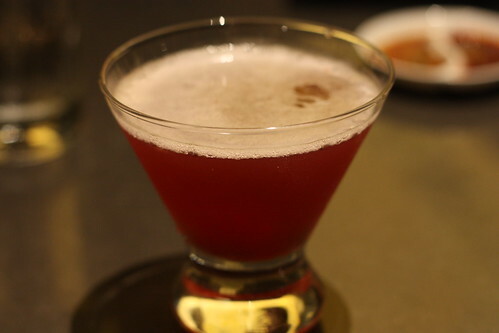 Sweet, and not too strong, but a nice cocktail to start off the meal. Fried seafood and vegetable, how can anyone not like this right? The dish as a whole was cooked well and had a nice diping sauce to accompany the dish, but none of the 3 choices stood out. 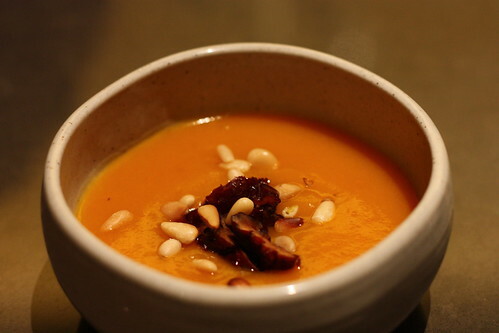 This was a nice version of the Korean pumpkin porridge. Along with toasted pinenuts and soju infused dates, I enjoyed this bowl, but it could have easily served without the dates. 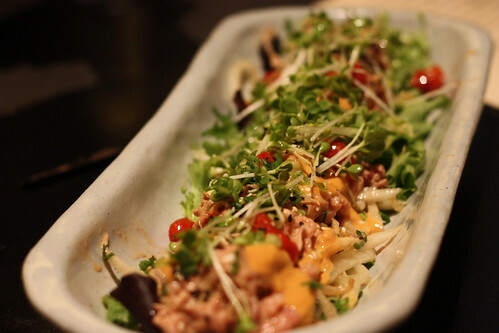 Nevertheless, an enjoyable dish. I'm not sure why this dish had "shiso" in its name as I barely tasted the supposed main ingredient. In fact, it should have been called Pear and Rib eye salad, as that was the overpowering ingredient. 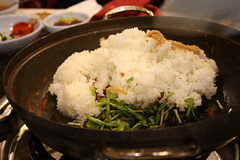 I wasn't too fond of this dish as it had too much meat (did I just say that?) to be really called a "salad." 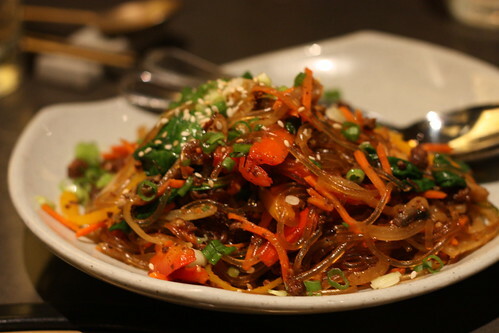 Japchae, or stir fried glass noodles with meat and vegetables is one dish I'm all too familiar with as it's one of the favorite thing my mom would make for me at home. After having other versions along with my mom's, the japchae at Gyenari is just too sweet for me. 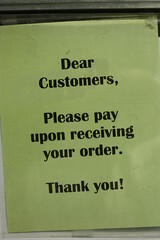 Although enjoyable, I'm not sure if I would order this again. 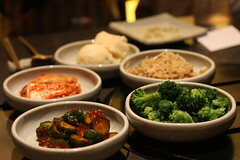 One of the highlights from the dinner at Gyenari was the banchan dishes offered. 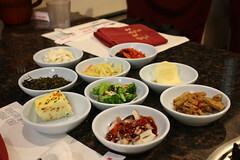 All the choices were quite traditional and very "Korean." 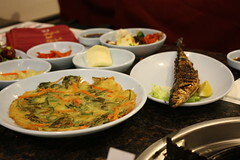 I enjoyed all the side dishes. 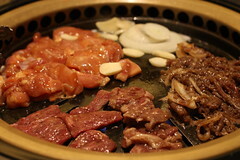 In terms of the G1 meat set, the meat were all very fresh and marinated well. 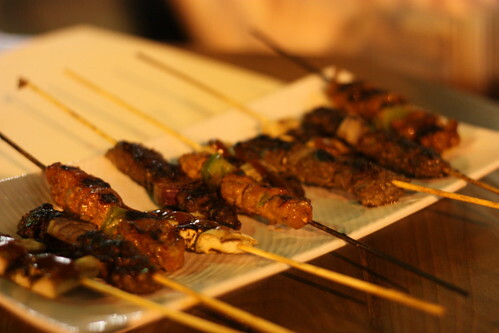 However, the marinade was again, way too sweet, which I don't think I enjoyed. 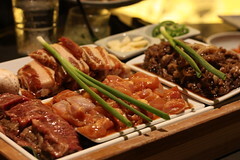 I liked the pork belly and the various dipping sauce offered to us. The chicken dipped into the chipotle mayo was also quite a nice combination. 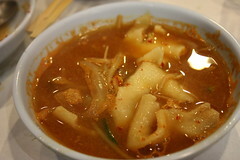 The kimchi jigae was nice, but it really did not need the tomatoes in the soup. This would have been much better without the tomatoes. 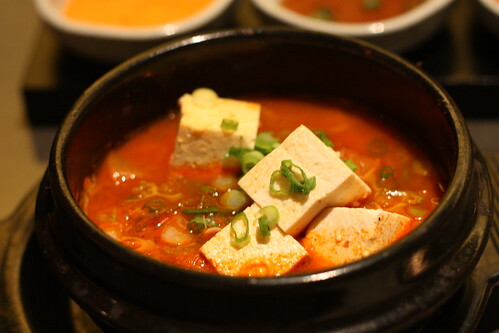 I do miss the spice from the usual kimchi jigae found in Koreatown. 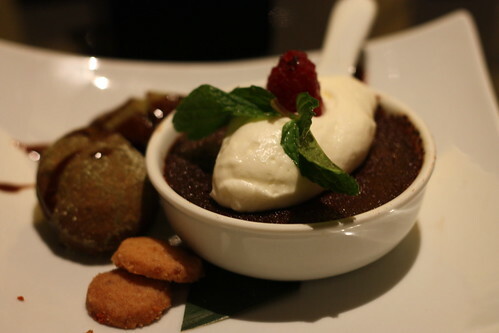 Dessert is probably my favorite part of any meal and the spicy chocolate creme brulee was quite nice, but slight too "chocolatey?" In addition, the beignet was slightly dry, but I solved that problem by dipping it into the creme brulee. All in all, a very pleasant ending to the meal. Overall, I'd have to say Gyenari was an interesting experience. The food was actually more authentic than I expected, but we didn't not receive any of the "Seoulful" dishes that Debbie Lee was known for. It'll be something I'd be interested in trying those dishes next time, perhaps at Happy Hour that runs 7 days a week that lasts until 8pm. 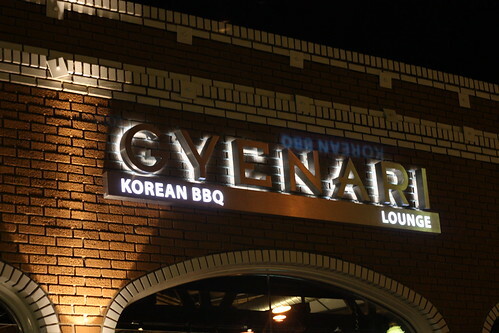 Although the dishes were sweeter and lack in the kick that I'm used to in Korean cuisine, Gyenari is definitely a good place for someone to try Korean BBQ or food for the first time. 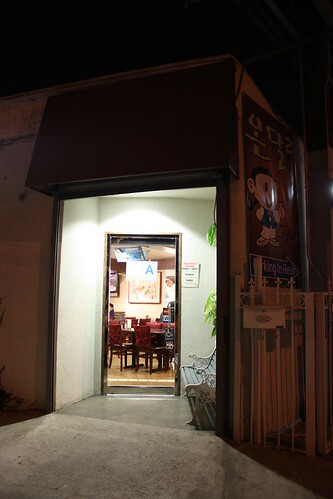 The food and flavors are quite tame compared to the same food found in Koreatown, but for the price, and quality, it's definitely not a bad deal. The service was friendly, the atmosphere was lively, and the bar made some bomb drinks. 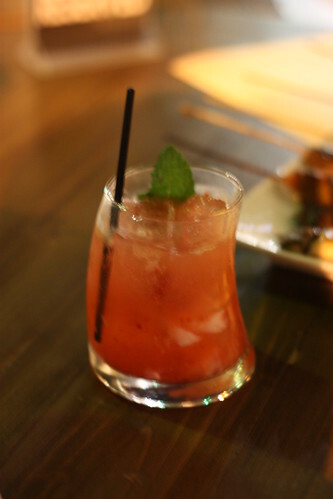 It's definitely one of the better restaurants to visit on the Westside for Happy Hour. 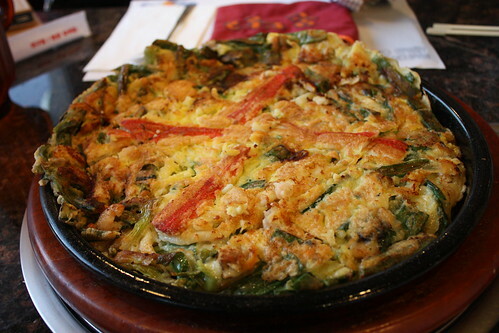 The things I like about Ondal are the clean atmosphere, 2 LCD TV in case there's a basketball game broadcasted (like the Fakers), and wonderful array of banchan (반찬) dishes. 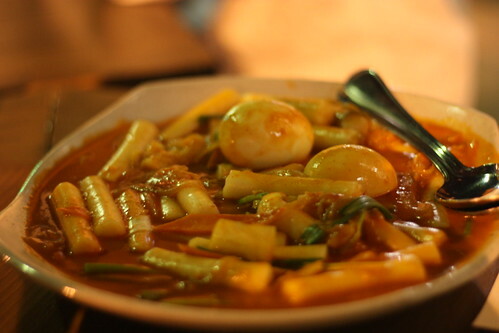 One of my favorites are the egg and the spicy octopus. 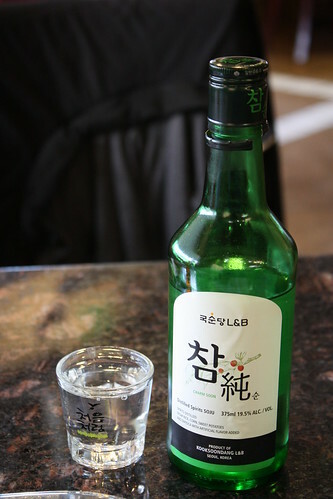 What's better than some soju to accompany the meal? 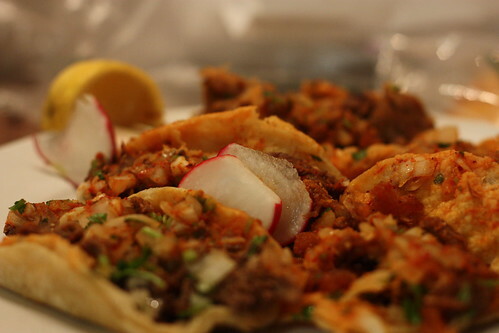 The hamul pajun here is fantastic, one of the better version I've had here in Los Angeles. 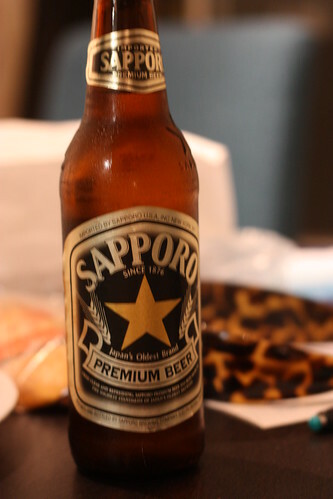 I always like to order this as an appetizer for the meal before the spicy crab soup hits the table. Sometimes the phrase "pictures equals a thousand words" really means something, or it's just that I'm too lazy explaining each course of this meal. The kkot geh tang it comes in either small, medium or large. A medium will feed a party of 4, and large feeds about 6. 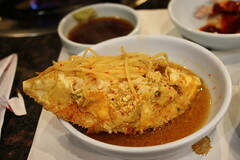 Each person will get a crab shell filled with rice while the crab itself will continue to cook inside the soup. 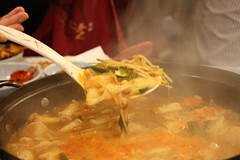 Once the crab and most of the soup are eaten, the next part of the meal begins. 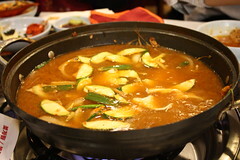 The 2nd part begins with zucchini and additional soup stock poured into the stew, and the "soo jeh bee" is formed and tossed into the pot. The soo jeh bee or hand formed dough is similar to "mian ge da," which is a type of dough/pasta known amongst the Chinese people. The pasta has good texture and with the soup, it's fantastic! 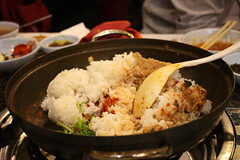 Finally, my favorite part of the kkot geh tang experience at Ondal, the bokeumbap (aka Korean Fried Rice). 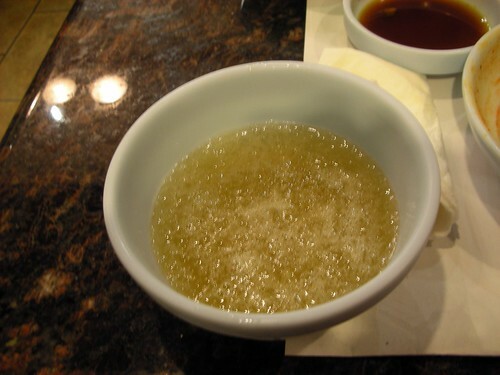 The ingredients are simple, but the end result is fantastic, maybe due to some of the crab essence from the soup. Let the rice cook a bit so the rice is slightly crispy. Now that's the best way to enjoy the fried rice! This is a great way to end the meal. Icy, sweet, and 100% delicious. Much, MUCH better than the canned version I've resorted to buy over time. 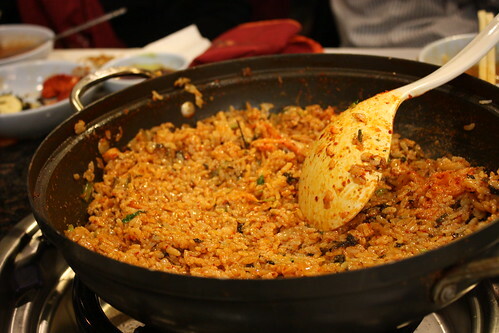 I really enjoy this version here and I wish more Korean restaurants would serve shikkae to end a meal. All in all, I really enjoyed the meals I've had at Ondal in the past. 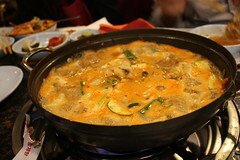 Especially with the winter months approaching, make a stop to Ondal 2 for some spicy Korean soup. 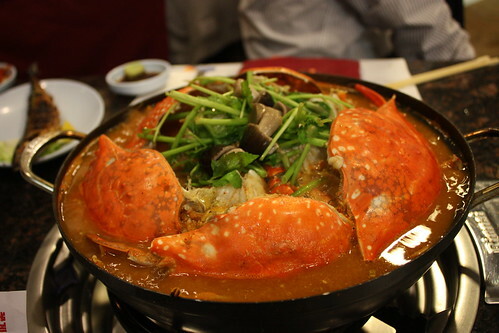 Although I've heard good things about their other stews, you can't go wrong with the crab version. 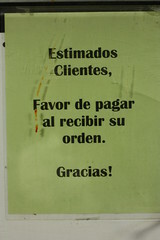 The service here is friendly and the place is clean. Hell, even parking is plentiful, although the area is slightly sketchy. Don't worry, valet parking is available for $1.50! Annyoung! 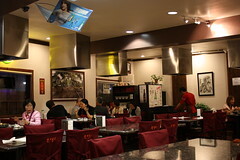 As many of you know, dineLA has been going on at over 200 different restaurants in the greater Los Angeles area. 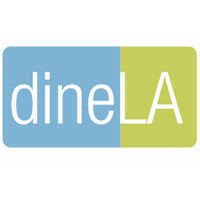 One of the better news of the day was the fact dineLA will be extended to Oct. 18th to 23rd for some of the participating restaurants. As of right now, the last available date will be Friday, the 16th. I've heard many good things about some of the restaurants during this yearly event, and I personally had a great time at Petrossian in West Hollywood. Check it out and support the business of some of your favorite restaurants in Los Angeles! Another event that I'm pretty excited about is the Tequila Expo 2009 in Tijuana. Our group will be lead by Bill of Street Gourmet LA and I'm sure we'll be in good hands. I'm excited about the food and tequila that I'll consume this upcoming weekend, I've already started to eat light in preparation! The Tequila Expo starts on Oct. 15th and last until the 18th. Visit the official website or simply call 619.232.5040 for more information. Finally, but not least, on October 25th from 1-4PM, Los Angeles Magazine is hosting The Food Event: From the Vine at the Saddlerock Ranch in Malibu. This event will be filled with some of the best wineries around California along with celebrity chefs like David Myers of Comme Ca and Sona, Ludo Lefebvre of Ludobites fame, John Sedlar of Rivera, and many others. Located in beautiful Malibu, this event is poised to be a lot of fun for the attendees. The best part of the event is due to the fact that a portion of the proceeds will be donated to benefit the American Heart Association/American Stroke Association and Kids Courage. For tickets and other information, please visit the official website. I'll see you there! I guess I'll write a quick review to celebrate my new blog url. Yes folks, I've purchased http://kungfoodpanda.com!! El Taquito taco truck, a truck I heard of while I was still posting on Yelp, but never visited since I was living in Torrance at the time. Time passed and I've relocated in the area and HELLO Tacos! Inspired by a post by PK, Gourmet Pigs and I ventured off towards the truck that's stationed at Nishikawa Auto Services on Fair Oaks. The menu here is simple, yet there are plenty of meat to choose from. 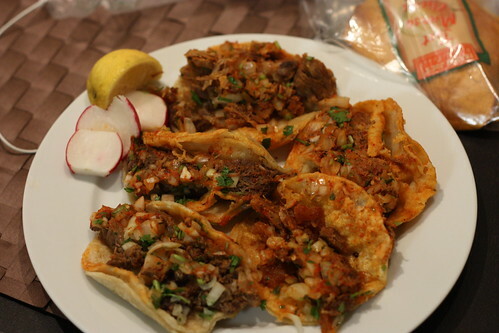 There are seven different types of meat choices, including cabeza (head), lengua (tongue), and the ever safe asada (steak). 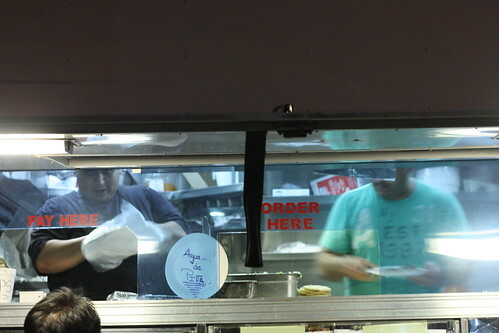 At $1.25/each, it's one of the best late night choices in the Pasadena area. Along with the meat choice, you're able to pick from either verde (green) salsa or roja (red). For those that prefer a spicier option, like myself, the roja is the way to go. 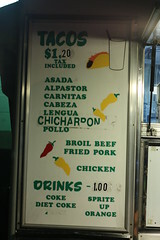 I ended up ordering 5 different tacos, one of each meat except asada and pollo (chicken) since those are too "normal." After looking at these pictures, I honestly have no idea what meat was what, but I'll just say, the tacos really hit the spot on a late Summer evening! What else goes better with tacos than some iced cold beer. I know it's not Dos Equis, Corona, or any other brand of Mexican beer, but cold beer + tacos spells winner for me, every single time! El Taquito Mexicano Truck may not be the best taco truck I've ever had, but in Pasadena, it's hard to find any better option than this. There's another truck down the street, but I'd stick to Taquito everytime! 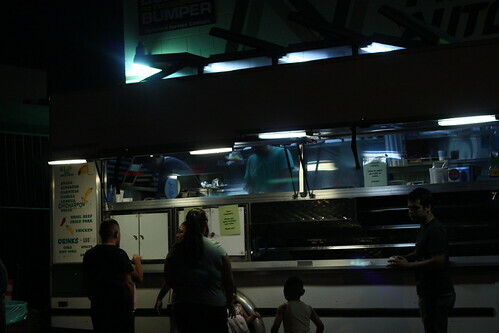 Seriously, forget Kogi, Calbi, and any of these random food trucks that's been popping all over West LA/DTLA. I personally will stick to these "roach coaches" everytime, anytime! *Update 12/15/09* El Taquito serves Horchata! Large is $2!